After being raised in rural Northamptonshire, England, Adams left school at just 16, and took an apprenticeship at a chemist — a pharmacy — called Boots, in Cambridgeshire. He did well: Boots, which also did research on drugs, paid for him to return to school and get a degree in pharmacy. Once out of school in 1945, he worked for the company to produce penicillin, and did well with that: he was moved to the company’s research department, and then got his PhD in pharmacology in 1952. His interest: rheumatoid arthritis. At the time, arthritis was treated with high doses of aspirin, which is tough on the stomach, or steroids, which have their own significant side effects. Dr. John Nicholson (center) and Mr. R. Cobb measuring inflammation in Dr. Adams’ arm after he took a candidate drug. In 1953, Adams started work on finding a new drug that would help treat arthritis. He and his team had hope for phenoxy acids. 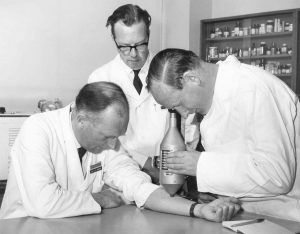 By 1961 they narrowed their target to phenyl-propanoic acids, testing one after another to see if it reduced inflammation …with negative results. After months and months of testing, including Stewart taking candidate drugs himself when he suffered from headaches (photo), the team finally settled on 2-(4-isobutylphenyl) propanoic acid as the most promising, and put it into clinical trials. The drug worked, measurably reducing inflammation and pain — and several times better than aspirin. It also had many fewer side effects than aspirin, and reduced fever. Boots was granted a license in the U.K. for the new drug on February 3, 1969 — exactly 50 years ago. They called it Brufen, and it was a revolution in the treatment of arthritis: the first successful nonsteroidal anti-inflammatory drug (or “NSAID”) since aspirin. Today the drug is better known by its generic name: ibuprofen. “It wasn’t only just me,” Adams would modestly say. “I don’t like to be considered as the inventor.” But he was proud to lead the team that brought so much relief to the world. In fact, ibuprofen is on the World Health Organization’s List of Essential Medicines, the safest and most effective medicines needed in any health system. Dr. Adams died on January 30 at the Queen’s Medical Centre in Nottingham. He was 95.